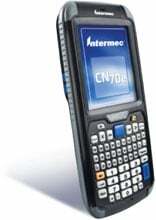 The Intermec CN70e RFID has been discontinued. No direct replacement is available. Superior read capability meets or exceeds typical handheld RFID read range requirements in a design that is more compact and comfortable to use. For businesses who want to accomplish in-premise data collection tasks with greater efficiency and accuracy, the no-compromise, fully-integrated CN70e RFID mobile computer provides the perfect balance of ruggedness, duty cycle and ergonomics to deliver optimal worker productivity in demanding environments. No other reader on the market has the same advanced computing capabilities. High Performance 2D Imager, QWERTY Keypad, No Camera, No Data Communication, RFID - USA, Windows Embedded Handheld, WWE, Smart Systems. Reader, Standard Range 2D Imager, QWERTY-Numeric Keypad, Camera, Wi-Fi (802.11a/b/g/n), Bluetooth, Windows Embedded Handheld, Smart Systems, US Version. Interface cables and charging cradle sold separately. CN70e RFID Reader, Non-Incendive, 2D Imager, QWERTY Keypad, No Camera, No Data Communication, Windows Embedded Handheld, Smart Systems, US and CA Version. Interface cables and charging cradle sold separately. CN70 RFID Reader, Wi-Fi (802.11a/b/g/n), 2D Imager Scanner, Windows Embedded Handheld, 512MB RAM/1GB ROM, QWERTY Keypad, Bluetooth. Interface cables and charging cradle sold separately. High Performance 2D Imager, Numeric Keypad, No Camera, No Data Communication, RFID - USA, Windows Embedded Handheld, WWE, Smart Systems. High Performance 2D Imager, Numeric Keypad, Camera, No Data Communication, RFID - USA, Windows Embedded Handheld, WWE, Smart Systems. High Performance 2D Imager, Numeric Keypad, Camera, No Data Communication, RFID - European, Windows Embedded Handheld, WWE, Smart Systems. Wi-Fi (802.11a/b/g/n), RFID, Non-Incendive, 2D Imager Scanner, Windows Embedded Handheld, 512MB RAM/1GB ROM, Numeric Keypad, 5MP Camera, Bluetooth. Interface cables and charging cradle sold separately. We used it track musical instruments - RFID scanning makes it possible to audit invetories without opening boxes or cases - saves time and money!!! We use the CN70e to assist in auditing our Fixed Asset Inventories. It has proven to be very versitle, durable and effective. We rely on the CN70e's accuracy and it has proven to be everything we wanted and more. Thanks Intermec!!! We use the RFID scanners and printer to control and audit our Fixed Assets - required by State and Federal mandates. Being able to scan a violyn without having to open their case has been a great time saver. What took 4 hours now can be accomplished with RFID in half the time.